Heralded as one of the best fishing destinations in Australia, the remote Cobourg Peninsula is only an hour’s flight from Darwin. Cobourg Fishing Safaris offer accommodated (fly in/fly out) fishing charters from Cobourg Coastal Camp. Catering for a maximum of just two fishing groups at a time they offer a very exclusive fishing experience. 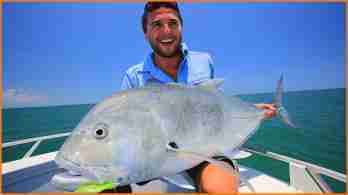 If you’re looking for that dream ‘bucket list’ trip to a genuinely wild and fish-filled stretch of Top End water with all the hard stuff taken care of for you, I would unhesitatingly recommend Cobourg Fishing Safaris' operation as being second to none.